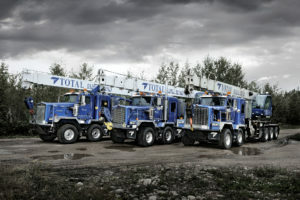 ﻿ Transportation - Total Oilfield Rentals Ltd.
Total Oilfield Rentals Ltd. has a large fleet of modern, well-maintained oilfield trucks, including 45 ton pickers, boom trucks, bed trucks, texas beds, winch tractors, service trucks and trailers. This transportation fleet not only enables us to mobilize our rental equipment, but also allows us to offer a premier general oilfield hauling service. Our trucking team specializes in service rig moves, camp moves, and the moving of testing, production and construction equipment.